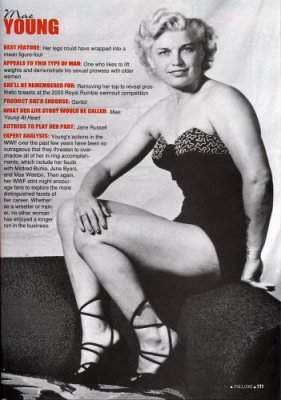 Mae Young was the female Gorgeous George in the 50s, complete with her own valet. Mae Young and Moolah ran a wrestling school together before they made their comeback in 2000. 2000: Mae Young was part of some of the WWF’s worst angles, including giving birth to a hand, and exposing her breasts on ppv. Mae Young was Bubba Bombed off the RAW Stage through multiple tables by Bubba Ray Dudley! ~~~Bubba didn’t want to do the stunt at first, but Mae slapped him accross the face and told him to treat her like one of the guys! January 14, 2003 – RAW X: Mae Young wins the NETWORK DIFFICULTIES award for giving birth to a human hand. June 15, 2003 – Bad Blood: Mae Young makes an appearance during the Redneck Triathalon Pie Eating Contest. June 16, 2003 – RAW: Eric Bischoff forces Mae Young into a match with Test, who drills Mae in the middle of the ring! September 15, 2003 – RAW: Mae Young appears on RAW next to Fabulous Moolah celebrating Moolah’s 80th Birthday! Janaury 5, 2004 – RAW: Mae Young makes another embarrassing appearance, and is shown getting out of the shower. November 11, 2003 – Smackdown! : Mae Young appears in a special “Make Out With A Diva” Tough Enough segment. October 3, 2005 – WWE Homecoming: Mae Young participated in a Legends Ceremony which included roughly 24 Legends. ~~~Earlier in the show, Mae Young managed to get half-naked, resulting in Ted DiBiase offering her $3000 to put her shirt back on! August 24, 2007 – SmackDown! : Mae Young was the surprise entrant in a special Summer Divas Bikini Contest. December 10, 2007 – RAW 15th Anniversary: Mae Young appeared in a segment about all the Divas who slept with Mr. McMahon! March 3, 2008 – RAW: They announced the next inductee into the Class of 2008 WWE Hall of Fame – (The Great) Johnnie Mae Young. March 29, 2008 – WWE Hall of Fame: Pat Patterson inducted Mae Young into the WWE Hall of Fame in Orlando, Florida. June 9, 2008 – RAW: Charlie Haas made a rare appearance on RAW, helping Vince McMahon give away $75,000..
November 3, 2008 – RAW: Beth Phoenix‘s Team defeated Mickie James‘ Team in a HUGE 16-DIVA Tag Team Match. ~~~Mae Young got some forearms in on some of the heel girls before taking a scary fall backwards hitting her head on the ropes! April 5, 2009 – WrestleMania 25: Mae Young appeared as the special guest bell ringer for the 25-Diva Battle Royal. October 23, 2009 – SmackDown! : Mae Young made a guest appearance and slapped WWE Women’s champion Michelle McCool! February 15, 2010 – RAW: Mae Young participated in an embarrassing in-ring segment with RAW guest host Jerry Springer. March 28, 2010 – WrestleMania 26: Mae Young had a brief cameo doing a comedy sketch with Santino Marella plugging Slim Jim! December 13, 2010 – The Slammy Awards: LayCool won the “Knuckhead Moment of the Year” Award for their conflict with Mae Young. January 14, 2014 – Mae Young passed away from natural causes. Dave Meltzer wrote: Regarding Mae Young, among those in the know it is generally believed that her 1939 debut is a worked date, and the real date is most likely early 1941. No records can be found from before that date, and she herself on Raw said she was 17 when she debuted, which would have been around 1941. People who have wrestling magazines from the 1950s also note that the stories written about her then always listed her debut date as 1941. She is still an amazing woman.